The LVC system of the Goodrum-Fechter BMS is finally wired up and working. I’ve now finally gotten around to dealing with the LVC (low voltage cutoff) issues that I’ve occasionally mentioned over recent months. 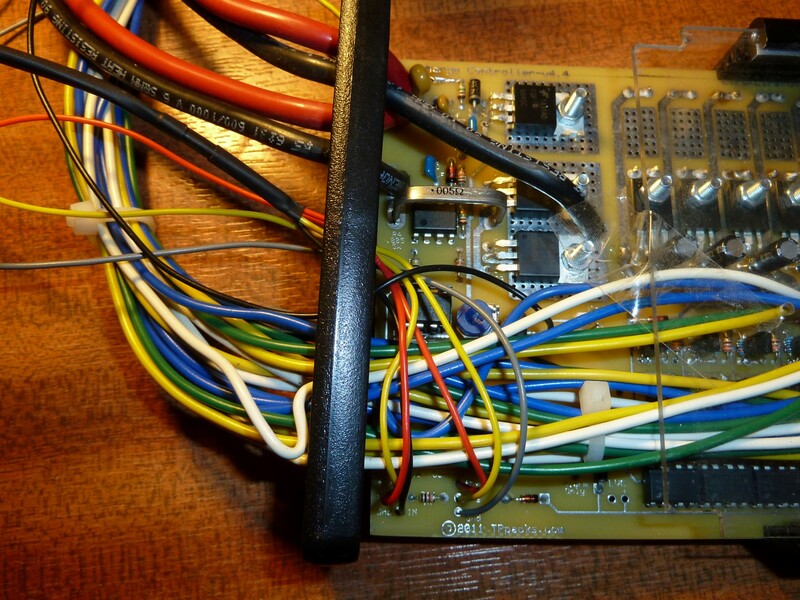 The Goodrum-Fechter BMS (that I’d built from the bare PCB and around 3,000 components!) 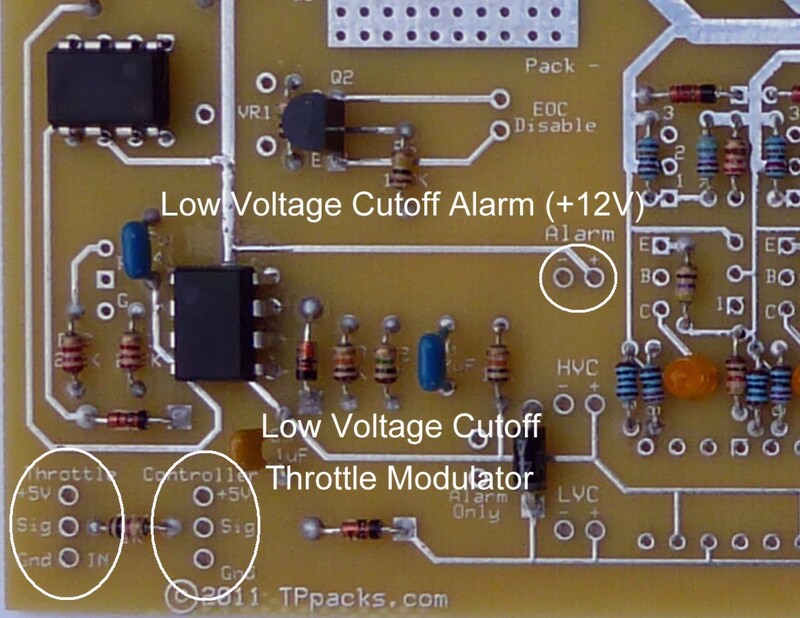 also includes a dedicated LVC circuit that detects low voltage conditions for any cell in the pack, and enables action to be taken to prevent the cell in question being discharged low enough to do it permanent damage. 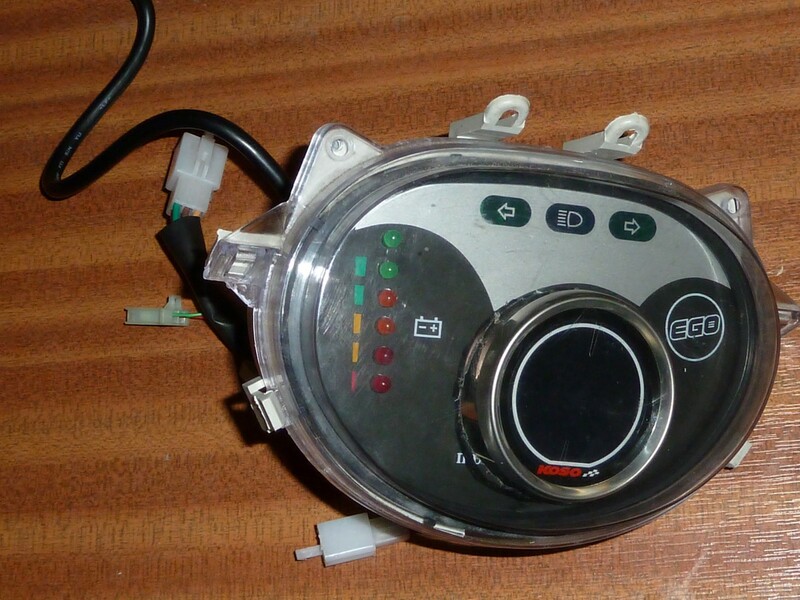 The system includes a Low Voltage Cutoff Alarm, and a Throttle Modulator which acts on a pass-through for the throttle wires to go on their way from the throttle to the controller itself. 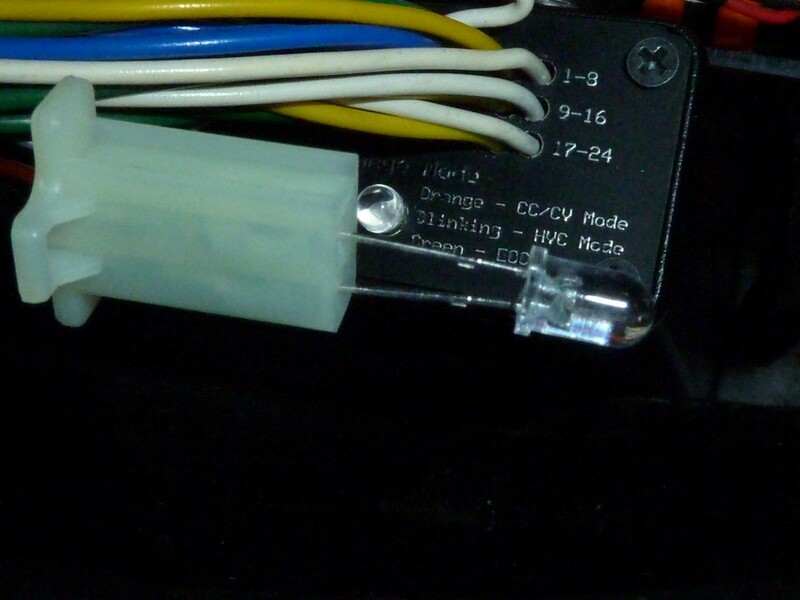 Once the voltage of any of the cells in the pack reaches a critical point (a little over 2.0V), the voltage across the LVC cutoff alarm terminals (see below) will rise quickly to 12V, where it will stay until the LVC condition is no longer met, and all cell voltages have returned above this threshold. In addition to these alarm terminals, there is also a pass-through for the throttle. 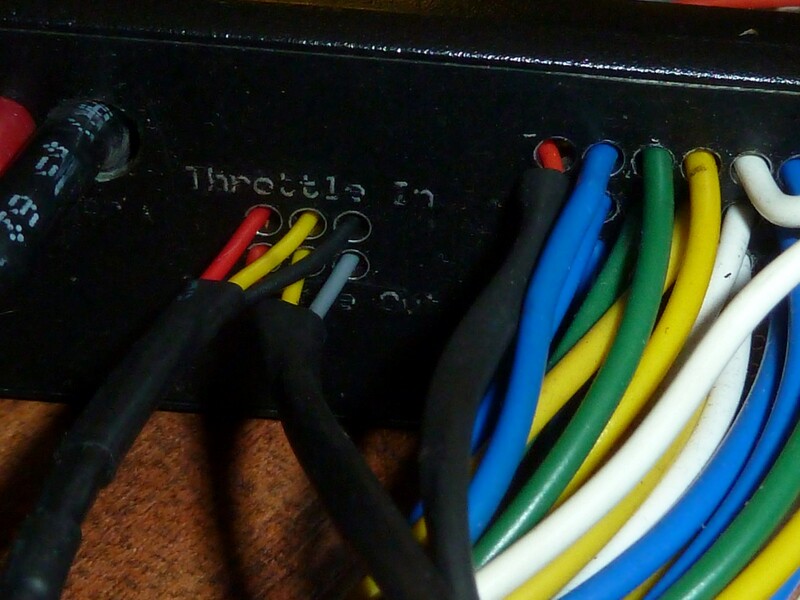 Here you can see the set of terminals for the throttle cable pass-through – the positive, the negative, and the signal wire. I’ve put a female 3-way mini connector on the “throttle in” wires, and a male 3-way mini connector on the controller-side wires. This arrangement makes it impossible to attach the throttle wires from the throttle, and the controller, throttle wires the wrong way round. The throttle pass-through lets the LVC system adjust the signal from the throttle as and when necessary. If any cell becomes dangerously low, the throttle signal will effectively cut out until the cell voltage has recovered. The effect of this is that as the battery pack power level declines, it will automatically ‘reign in’ any use of the throttle that’s severe enough to result in voltage dips as a result of heavy load on the battery. This is particularly prone to happen when power is drawn very rapidly, such as when taking off from a full stop or going up a particularly steep hill. In these circumstances, the LVC subtly modulates the throttle signal so that the lowest cell is protected from any voltage dips caused in this way, and acceleration eases off accordingly. Above, you can see the three cables I’ve added for the LVC system: The throttle pass-through (left, middle-bottom) and alarm signal (right). 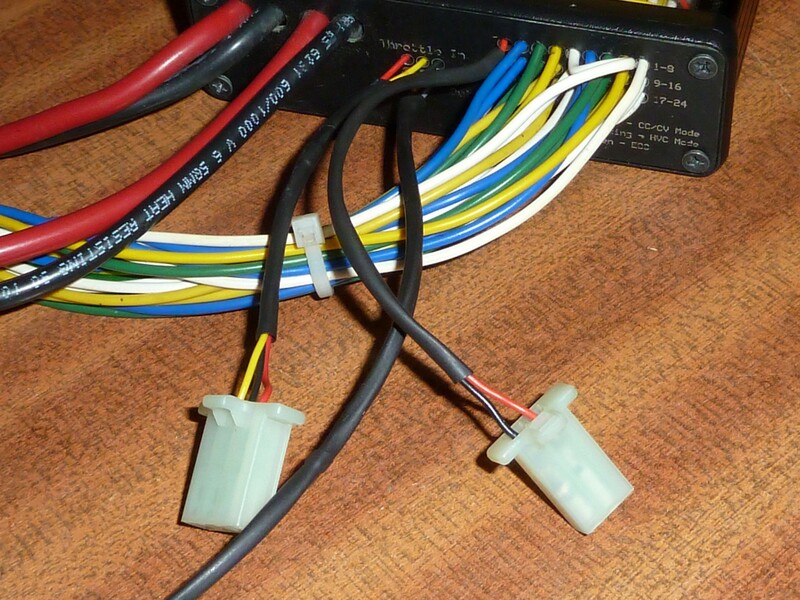 Once the BMS has been put back in position on the bike, I just detach the throttle from its direct connection with the controller, and clip both of those connectors into their counterparts on the BMS. The good thing about his system is that – if I really desperately need to get somewhere and am prepared to risk damage to cells in the pack – I can override the LVC system by just reconnecting the throttle directly to the controller again. The second part of this system is the alarm I mentioned earlier. 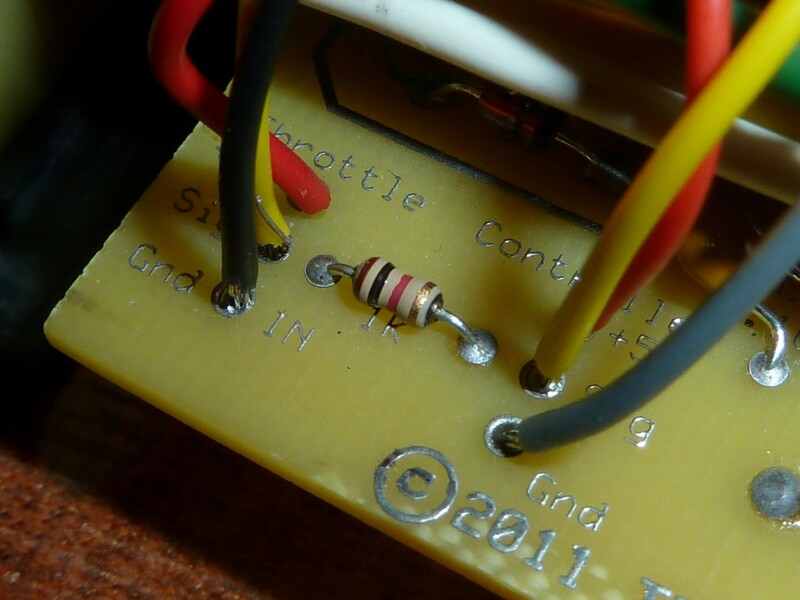 I ran the alarm terminals on the PCB to an external two-way mini connector, which I could then use to power whatever I want to be powered once the alarm-level voltage threshold has been tripped. I originally wanted this to run to a warning diode on my instrument display, but since it puts out 12V, it’s too much for a diode (which is limited to about 4V), I couldn’t do this in the way I’d originally envisaged. The battery meter upgrade that I’d done, and which was designed for the discharge characteristics of the old SLA bank, could not be used with my LiFePO4 Lithium Pack, and so was now just sitting there unused, with a row of 6 perfectly good LEDs on display. So I decided a temporary solution that was crude but effective: 12V was too much for just one LED, but if I linked 3 LEDs together in parallel they would be forced to “share” the 12V into 3 lots of 4V, which each LED can take okay. I could have just wired in a resistor but I liked this solution because I preferred to have more than one LED flashing for an LVC condition – just for the urgent look of it. Above you can see where I’m putting the LVC system to the test. 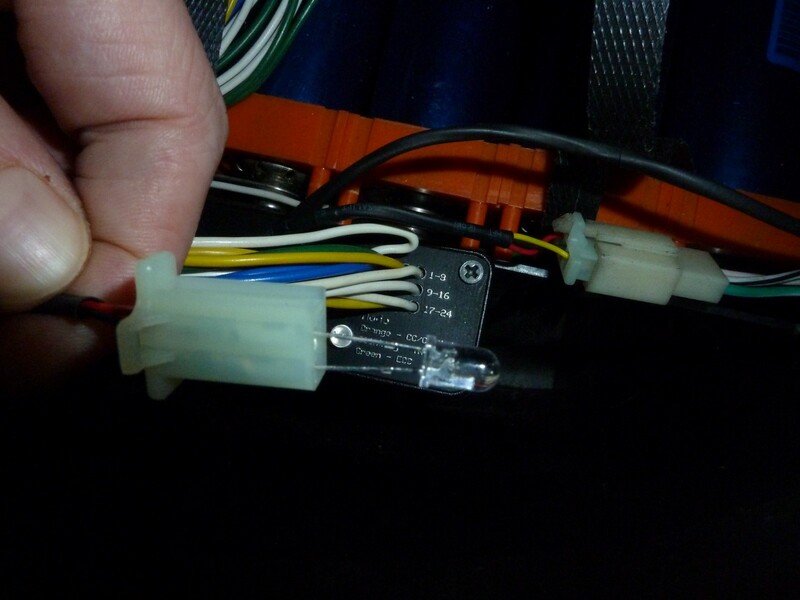 The 12V alarm connector has been connected to a superbright LED, and the bank has been run down to the point where the alarm is easily triggered by opening up the throttle a little. Yes, I know that I just told you that LEDs only take about 4V, but it’s okay here because the LVC is just above threshold and I can just nudge the throttle open briefly so that I only get a brief burst of the alarm output and can see the LED flash or glow without frazzling it. In any case I have a bag of about 100 of these that I bought on impulse because of how cheap they were in bulk (about £6/$9 per 100!). Using this method I was able to test it out an confirm that it did indeed give me the signal I wanted and when I wanted it. Now it was just a matter of running a cable to the instrument display. But this also meant that I had to parallel wire three of my LEDs and run a two-way mini connector out of the back of the display to join with it (the alarm cable). In the end I decided to use the bottom three LEDs – one orange and two reds – as my alarm display. While I was at it I put in a two-way mini connector for the top green LED as I currently had nothing showing on the instrument display to even indicate that I had the bike switched on! This time I just used a 100Ω resistor in series to drop the voltage within the range of the required 4V. After putting it all back together again and going for a few rides where I ran the pack low, I got to see the fruits of my labours. As the pack started to get low, I would see the alarm lights just occasionally blink when I pulled away or went up a particularly steep bit of terrain, and this would steadily worsen until the three LEDs were constantly lit, albeit fairly dimly at first. At the same time, the throttle would become less and less responsive, and the motor would take on an odd note if I tried to pull the throttle fully open. Eventually, over the course of a mile or two, the bike would just get slower and slower, eventually grinding to a halt with the three alarm LEDs fully lit (well lit, but not too brightly). From the first warning winks of the alarm LEDs to when the bike finally ground to a halt was about five miles, which gives me more than enough warning, and plenty of time to get to a power socket to recharge. 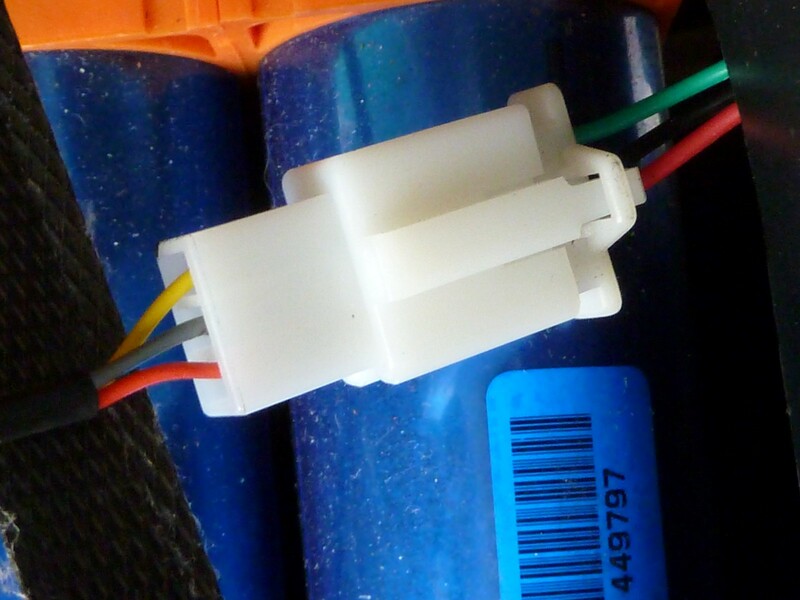 So, finally, I have a reasonably foolproof LVC system that should protect me from damaging the cells of my battery by letting them get too low, as I have occasionally done over the last couple of years. This type of system is a must if you don’t want the headache of constantly checking cell voltages or removing the pack for servicing, not to mention the cost of replacement cells. You are currently browsing the archives for the 4.7.4. 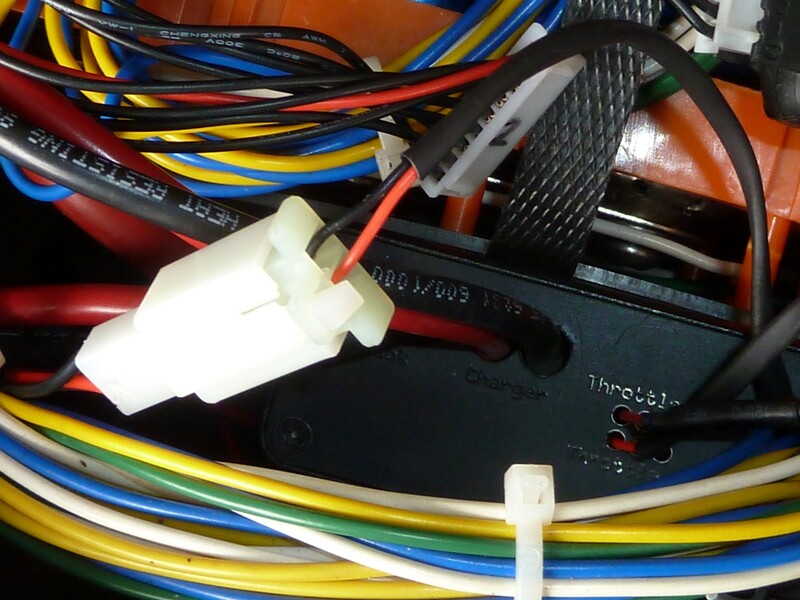 Wiring in an LVC System (Goodrum-Fechter BMS) category.